MD Horse Industry partners will host 11 days of free equine educational and entertainment events during the Maryland State Fair. Meet horses at the fair! 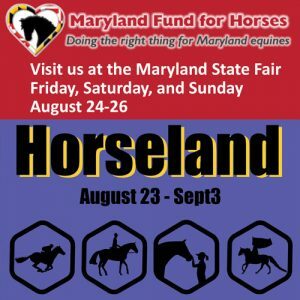 The Maryland Fund For Horses booth will host horses on Saturday and Sunday, August 24 & 25, and we will be at our booth on Friday evening too. If you’d like to help us staff the booth, please sign up to volunteer here: bit.ly/MFFH-AT-THE-FAIR.